We do not provide video estimate service anymore. We have access to technology that has been underutilized in the moving industry until now. Your smart phone unlocks the ability to no longer have to let a moving company in your front door to conduct an estimate! 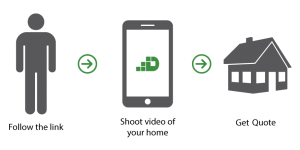 An easy, secure live video chat will allow you the control and flexibility for showing a moving company what you want to move. 6. Obtain an estimate for your move! Not only is this more convenient for you as the consumer but now we will be more prepared for your move since we’ve captured the first hand experience. This is the first step to the start of your successful move. Secondly you’ll have to decide on self service movers or full service movers. We’ve listened to your feedback and feel confident that the virtual experience will be most convenient for you during the stressful time of moving!